Latest post Mon, Feb 19 2018 10:34 PM by Anderella. 12 replies. after updating my system from MC Version 8.7.0 to 8.9.3 Avid Media Composer crashes on startup during initializing audio effects. For crosscheck I went back via carboncopycloner to my last running system, and updated my system to osx 10.11.6. 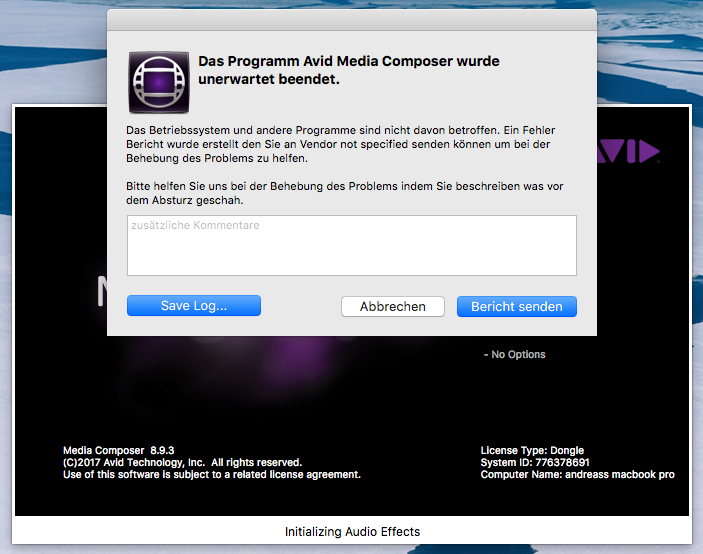 Afterwards I updated Avid MC to Version 8.9.3 - same problem, crash on startup. You definately have a plug in that doesnt like the new version of the new OS. Serach for your plug in folder and drag it to the desktop. launch and I suspect it will work. Now you need to remove them a few at a time to find out which one is the culprit. It could be that the version of MC First required a new OS and or that new version of MC First wasnt competible with the plug in that is causing the issue. No way to "read out" the Crash Log ? Wait - it this Media Composer or Media Composer | First we re talking about here? Moved to the Media Composer Mac forum. Go to: Mcintosh HD and search for AVX PLuig In folder. Duplicate the plug in folder - empty it. drag the content of the original Plug in folder into the copy. then a few at a time, out them in the original folder in the location where the AVX folder orignally was. The folder is in /Library/Application Support/Avid. Had been busy..... sorry for the delay. to a new desktop folder. Afterwards I moved back plugin by plugin and tried to launch MC. wirh all other plugins back in the avid subfolder and MC started like it should. For cross-check I afterwards also put the "bad-guy" back in the plug-ins folder - and this is really weird, now MC started without any problem...... ! It might have been a permissions issue? Perhaps copying it back and forth solved something. Anyway, enjoy the working system!